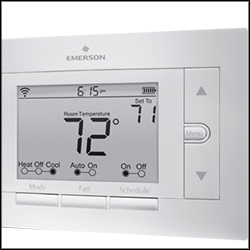 Emerson Sensi Wi-Fi thermostats keep you connected and in the know, no matter where you go or what the day brings. From across the room or across the country, use the intuitive mobile app to remotely control and schedule your home comfort — anytime, anywhere. Pro-Tech HVAC professionals proudly carry and install Sensi’s top-of-the-line thermostats. All of the products that we carry are from reputable companies with proven track records in the industry. Contact Pro-Tech today to get a Sensi thermostat installed in your home! For more information about Sensi products from Pro-Tech Heating & Cooling, please contact us here or call us directly at 616.453.5000.